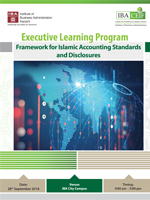 IBA Centre for Excellence in Islamic Finance is pleased to offer a one-day intermediate level course on Islamic Accounting Standards and disclosure requirements in Financial Statements of IFIs. The course is uniquely designed for participants seeking to develop an understanding of the Accounting standards which have been approved by ICAP and implemented by IFIs locally. The course also demonstrates, through case studies and interactive exercises, an understanding of disclosures apt for Islamic modes of financing.